When Rivka starts searching for the past, she decides to interview her mother and aunts, all survivors of the Holocaust. Her Jewish family was determined never to speak about their wartime experiences. She attends an organized Buddhist trip to Auschwitz, wanting to investigate right there what names, dates, and stories may teach her. 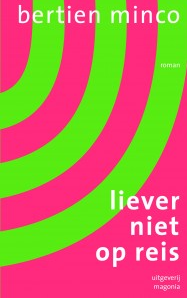 The novel is situated in a past-Holocaust Jewish community of Groningen, a small town in the north of the Netherlands. Only 10% of the Jews of Groningen survived. Most of them left the province, trying to leave the memories behind. Rivka’s family stayed in Groningen, trying to carry on Jewish life with a few survivors. Breaking the silence doesn’t mean that everything will be told. We follow Rivka in her attempts to unfold secrets. Most of all Not going anywhere portrays a gripping story of a historical Perpetuum mobile.